Ready or not, your sweet new addition to your family will be arriving soon. But you might be surprised at how much room a tiny baby needs. From furniture to toys to clothing and gear, your baby may have as much stuff in the house as you do – and they haven’t been born yet! Nursery preparation for your little one can seem daunting, but it doesn’t have to be. Check out our simple tips for turning that spare room into a dream baby room for your bundle of joy. Tackle the clutter in your spare room by creating three separate piles: keep, toss, and donate. Once you finish sorting your items, go through your kept items and decide which ones you can relocate within the house and which ones will go in storage. If you’re running out of room in your home, you can rent a storage unit to house those or other items that you’re not quite ready to part with. You can donate any unwanted items to Salvation Army, Goodwill, or other local charity like a women’s shelter. Or, you can hold a yard sale or give items to a friend or family member. Before you clear out the spare room completely, see if any of the existing items can be used in the baby nursery. This can help save you money when shopping for nursery accessories and furnishings. Believe it or not, there does exist a world outside of pink or blue baby rooms. Gender neutral color palettes like yellows and grays are trendy in today’s baby nurseries. The color and theme of a baby nursery can give the entire room a unique look and vibe your baby will enjoy growing and learning in. But remember, your baby will grow, and changing the baby room to match their change in taste and preference can get expensive. For baby nursery inspiration, there are hundreds of baby room Pinterest boards that can give your mind a creativity boost. Furniture for Baby’s Room – Upcycle, New, or Skip It? Furniture isn’t cheap, even when it’s made for little people. To save on furnishings without sacrificing safety or quality, consider using non-traditional items to fill traditional roles. For example, if you have a low dresser with plenty of space on top, this could double as a changing table. Ask yourself which items you really need, which ones would be nice to have but not necessary, and which ones you can skip altogether. Some parents report that having a changing table wasn’t an absolute necessity, while other parents loved having one. And don’t forget about a comfortable glider or rocker for yourself. Moms and dads spend hours in the nursery with their little one, and need a comfy place to sit. Your baby will spend a lot of time on the floor, so start from the ground up when thinking about cleanliness and safety in your nursery preparation. The flooring you choose can have an impact in your baby’s health and safety, especially when they start walking or crawling. You’ll need to decide whether you want carpet or a hard surface in the nursery, along with benefits and downsides of each. For instance, carpet can help cushion falls and provide a comfortable place to play, but they stain easily and can harbor allergens and other debris. Hard floors are easier to clean, but can feel uncomfortable for crawling and tottering babies. If you are using existing carpet, have it professionally cleaned as part of your nursery preparation. Everything you place in your baby nursery, from toys to bedding to curtains, can impact your baby’s safety. 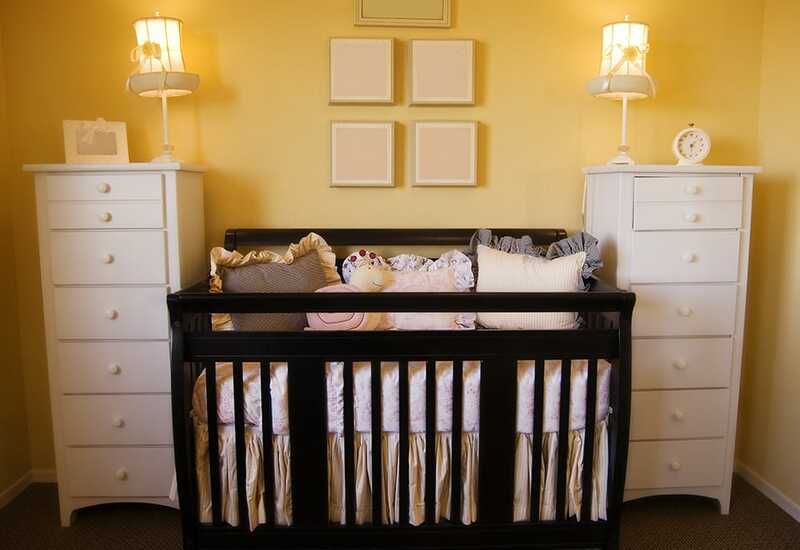 Make sure you choose nursery accessories that are soft and rounded to avoid poking your child. Also, place items in locations that your baby cannot reach from their crib, such as the power cord from a lamp. You and your baby will spend a lot of time in the nursery, both day and night, so invest in adequate lighting. You may want to include a soft lamp for those middle-of-the-night diaper changes, in addition to a nightlight that lets you check on baby without turning on a brighter light. Ceiling fans can also provide a good lighting option, as they help circulate the air and double as a mobile that will keep your baby enthralled. Nursery preparation usually calls for a fresh coat of paint to brighten the room. Try to choose one that also kills mold and mildew to make the nursery a little safer for their health. Make sure you paint the room well ahead of time to allow paint fumes to dissipate before the baby will need the room. Giving the baby nursery a fresh coat of paint certainly isn’t a requirement, but it can give the room the finishing touch that makes it a special place just for your baby. Babies tend to have lots of other things that have nothing to do with the nursery, such as pacifiers, diaper cream, bottles, wipes, bibs, and baby lotion, to name a few. These things don’t always fit in your nursery layout, which means they’ll share space in other rooms of your home. Wherever these items are kept, make sure your baby can’t reach them from their crib or play area. Babies are curious about the world around them, and will likely put things in their mouths that shouldn’t be there. Even items that are made for babies can be hazardous to their health if used incorrectly, so make sure their belongings aren’t accessible to them unless they should be. As you’re preparing for baby, you might discover that you need to clear more space than just your spare room. In this case, you can go through the same “keep, toss, donate” method to eliminate items from your home and move additional items into storage. Contact your nearest Value Store It location and let us help you clear some space for your new addition.